* Nobody Doubts Darwin They Say: Nobody qualified, anyway. Certainly no scientists! This week celebrating Darwin Day the Pew Research Center claimed that evolution, "is accepted by virtually all scientists" and a while back PBS promoted their series, "Evolution" claiming likewise that, "Virtually every scientist in the world believes the theory to be true." Taking that even further, theoretical physicist (emphasis on the theoretical) Lawrence Krauss told RSR that biological science cannot be practiced without a belief in Darwinian evolution and so "all scientists are atheists." And hence, Darwinists. However, he forgot James Tour. And they're all forgetting Fred Williams and Bob Enyart's ever-growing meta-list of highly-educated Darwin doubters including many thousands of Ph.D.s, scientists, and professors! The guys also have reported on the hundreds of astronomers, astrophysicists and cosmologists who doubt the Big Bang. (See below rsr.org/doubters#bb). So welcome to Real Science Radio's List of Scholars Doubting Darwin! - 100,000 college professors in the U.S. alone who, according to Harvard researchers, agree that "intelligent design IS a serious scientific alternative to the Darwinian theory of evolution." - 570,000 medical doctors in the U.S., specialists in applied science, say God brought about or directly created humans. Whereas Darwinism is dominated by storytelling, the field of medicine is an actual applied science (see definition and applied science section below) within biology that is practiced by highly educated professionals. Thus it is significant that 60% of all U.S. medical doctors reject the strictly secular Darwinist explanation for our existence, with three of five docs agreeing that either God initiated and guided the process that led to human life or that God specially created human beings as we are. * Of Course There's Overlap: Admittedly the lists above contain some overlap but the orders of magnitude difference in the numbers indicate that the vast majority are not duplicates. * The Third Way: Twenty highly-credentialed anti-creationists at The Third Way agree with young-earth creationists on this specific point, that the natural selection mechanism of neo-Darwinism cannot account for the diversity of life. These "Third Way" scientists, who by blind faith believe that their must be a third way other than Creation and Darwinism, include molecular biologists, etc., from institutions like Oxford, the University of Chicago, Tel Aviv University, MIT, University of Vienna, University of Bonn, UCLA, and Princeton. 2.5 Million U.S. scientists and engineers believe in a personal God. This number comes from the 40% who believe in a personal God as reported by the New York Times in 1997 (see below). That percentage had stayed constant over the 80 years since the survey was first carried out in 1917. If that result has stayed consistent again over the past 20 years, then based on our 2016 population of more than 6.2 million scientists and engineers, two and a half million of them believe in God! - Gravitas. It is observed that "authorities" should not be counted, but weighed. So weigh them. (Not counting the two million just indicated, the two-thirds of a million PhDs, MDs, professors, and advanced degreed scientists listed above who doubt Darwin would weigh more than 100 million pounds. - Consider also the RSR list of the many fathers of the physical sciences, both before and after Darwin, who rejected naturalistic origins, including Copernicus, Bacon, Kepler, Galileo, Harvey, Boyle, Huygens, Newton, Linnaeus, Cuvier, Dalton, Faraday, Pasteur, Joule, Kelvin, Lister, and Carver. * Oxford Biology Professor Rejects Neo-Darwinism: In 2013 a British biology professor, Oxford University's Dr. Denis Noble, argued against Neo-Darwinism in the journal Experimental Physiology. Of great significance, partly because Noble remains a committed evolutionist, nonetheless, he acknowledged, "that all the central assumptions of the Modern Synthesis (often called Neo-Darwinism) have been disproved." [b]wrote that "current evolutionary theory… largely avoids the question of how the complex organizations of organismal structure, physiology, development or behavior—whose variation it describes—actually arise in evolution." Müller also admits what creationists have long observed, something that promoters like Richard Dawkins are blind to, that calls for "a major revision or even a replacement of the standard theory of evolution... cannot be dismissed as a minority view but rather is a widespread feeling among scientists..."
* Enyart Debate Opponent and Gerd Müller Admissions: Compare Bob Enyart's debate opponent, well-received author and evolutionist James Hannam's assessment with Müller's admission. * A Majority of the Most Accomplished Nation: In 2013, 62% of Americans say that they believe that God either guided the development of, or specially created, human beings. This means, of course, that the majority of the population of the most technologically and scientifically accomplished reject the central tenet of Darwinism, which is that the diversity of life on Earth is explained by undirected, natural processes. * Percent of Faithful Scientists Constant from 1917 to 1997: The New York Times reported in their article, Survey of Scientists Finds a Stability of Faith in God, on an old survey repeated verbatim 80 years later in 1997. "To the extent that both surveys are accurate readings, traditional Western theism has not lost its place among U.S. scientists, despite their intellectual preoccupation with material reality.” The 1917 atheist who conducted the original research, "predicted that more and more scientists would give up their belief in God, as scientific knowledge replaced what he considered to be superstition." However, as the NYT updated the story, eight decades later, "A full 40 percent of scientists believe in a personal God and afterlife, according to a 1997 study." Scientists are experts in operational physics, chemistry, and biology. Most scientists believe in naturalistic origins. Therefore naturalistic origins must be true. Aside from the severe misrepresentation that "all scientists are Darwinists", it is also a logical fallacy to imply that success in operational science translates to authority regarding origins. * Summary of the DI's Scientific Dissent from Darwinism: The Discovery Institute describes the hundreds of scientists who have signed their statement of dissent as made up of those holding "doctorates in biological sciences, physics, chemistry, mathematics, medicine, computer science, and related disciplines from such institutions as Oxford, Cambridge, Harvard, Dartmouth, Rutgers, University of Chicago, Stanford and University of California at Berkeley. Many are also professors or researchers at major universities and research institutions such as Cambridge, Princeton, MIT, UCLA, University of Pennsylvania, University of Georgia, Tulane, Moscow State University, Chitose Institute of Science & Technology in Japan, and Ben-Gurion University in Israel." * Non-religious Darwin Skeptics: As reported by Casey Luskin in the Christian Research Journal, the Non-Religious Skeptics of Darwinian Evolution include Rutgers' Jerry Fodor, National Academy of Sciences member and biology professor Lynn Margulis, Thomas Nagel, molecular biology post-doctoral fellow at Columbia University David Berlinski, the University of Warwick's Steve Fuller, and NAS member Philip Skell. * Even Evolution Journal Admits Doubt of Primary Evidence: Many evolutionists including Dawkins (as in his extrapolation from canine diversity) oversell the claim to the public that small changes within species prove that over long periods, the species themselves arose naturally. However, out of the hearing of the general public, evolutionary biologists themselves are more honest. As in the Journal of Evolutionary Biology itself, "A persistent debate in evolutionary biology is one over the continuity of microevolution and macroevolution – whether macroevolutionary trends are governed by the principles of microevolution." In house, this is a debate. Outside, Darwin marketing reps like Dawkins, Coyne, PZ Myers, and Krauss pretend this is settled science. As Nagel concluded "Mind and Cosmos", today's evolution "consensus... will come to seem laughable in a generation or two." * Templeton Funds Evolution Rethink: From the journal Science, "For many evolutionary biologists, nothing gets their dander up faster than suggesting evolution is anything other than the process of natural selection, acting on random mutations. So some are uneasy that the John Templeton Foundation has awarded $8.7 million to U.K., Swedish, and U.S. researchers for experimental and theoretical work..."
- hundreds more secular scientists who have signed the extraordinary declaration at cosmologystatement.org including those working at leading institutions such as the Max-Planck Institute for Astrophysics, Sheffield University, George Mason University, Jet Propulsion Laboratory at CalTech, Cambridge University, Lawrenceville Plasma Physics, Penn State, Cal State Fullerton, University of Virginia, European Southern Observatory, and scores of other prestigious institutions. * Crichton on Consensus: When you hear consensus, consensus, you might have reason to doubt the consensus. Physician and Jurassic Park author Michael Crichton warned at CalTech: "I regard consensus science as an extremely pernicious development that ought to be stopped cold in its tracks. Historically, the claim of consensus has been the first refuge of scoundrels; it is a way to avoid debate by claiming that the matter is already settled. Whenever you hear the consensus of scientists agrees on something or other, reach for your wallet, because you’re being had. Let’s be clear: the work of science has nothing whatever to do with consensus. Consensus is the business of politics. Science, on the contrary, requires only one investigator who happens to be right, which means that he or she has results that are verifiable by reference to the real world. In science consensus is irrelevant. What is relevant is reproducible results. The greatest scientists in history are great precisely because they broke with the consensus. There is no such thing as consensus science. If it’s consensus, it isn’t science. If it’s science, it isn’t consensus. ... I would remind you to notice where the claim of consensus is invoked. Consensus is invoked only in situations where the science is not solid enough. Nobody says the consensus of scientists agrees that E=mc2. Nobody says the consensus is that the sun is 93 million miles away. It would never occur to anyone to speak that way." * In a Third of a Century, Creationism Holds, Theistic Evolution Declines: Over a 32 year period, the Gallup organization has asked Americans about human origins. While of course surveys are often inaccurate and people's views often more complex and nuanced, and even self-contradictory, than polls tend to reveal, notice the general trend. 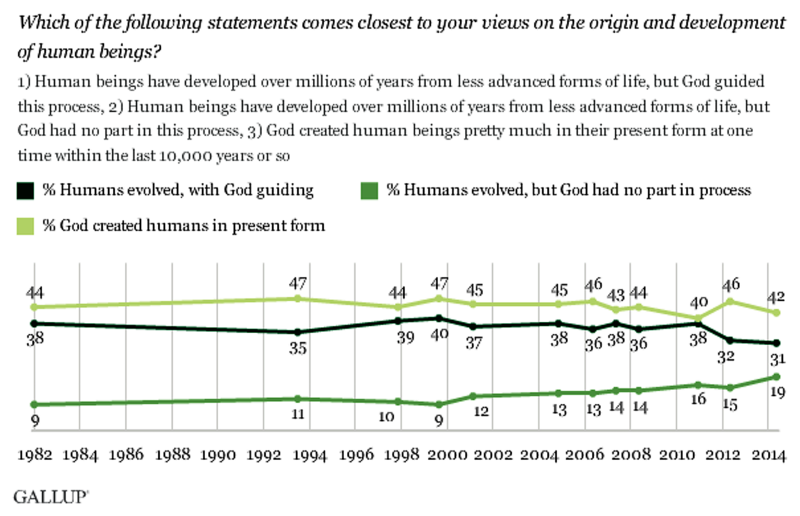 The godless view, that humans evolved without any kind of divine involvement, more than doubled from 1982 to 2014. The young earth creationist view mostly held steady, within the survey's margin of error, from 44% to 42%. That staying power exerts itself against the onslaught. Consider the Darwinist propaganda funded by hundreds of billions of dollars spent through public school teaching, TV entertainment networks, Hollywood messaging through a high percentage of their films from animated children's movies to scifi, biased government grants, the mainstream news media and publishers including virtually all magazine and newspaper editorial boards, all of the cable science, discovery, and National Geographic networks, and through the official teaching of the Roman Catholic Church, all mainline Protestant denominations and most Protestant seminaries and Bible colleges. But then, if Gallup shows a determined continued belief in young-earth creationism, as their third option described, "God created human beings within the last 10,000 years or so", then where was the defections from belief that enabled the materialistic view to about double? Not surprisingly, it came from a camp that can roughly be called, very roughly, theistic evolution. During the 32 years of these surveys, those who held that "Humans evolved with God guiding" lost nearly ten percent of that camp, dropping to just over 30% of the population. No wonder. See our Trading Genesis video, above! By such an overtly invalid statistical method, atheists themselves would comprise only two-hundredths of one percent of 230 million U.S. adults if we calculated using "one count" of atheists, namely, the membership of the Skeptics Society. Of course that's wrong. * Newsweek Reporters Larry Martz and Ann McDaniel: In 1987 Martz & McDaniel wrote, "By one count there are some 700 scientists with respectable academic credentials (out of a total of 480,000 U.S. earth and life scientist) who give credence to creation-science, the general theory that complex life forms did not evolve but appeared "abruptly." To a request for more details, on June 12, 2012 Ann McDaniel replied to Real Science Radio: "Bob – I wish I had the notes for that story, but I don’t have everything from 25 years ago, and I don’t remember. So sorry that I cannot help you." On April 1, 2013 Larry Martz wrote, "Mr. Enyart, ... I was the New York writer on this story, working from reports from Ann McDaniel and others who weren't named in the byline, along with whatever telephone reporting I did myself. I don't remember which of them came up with that figure, or what its provenance was. It might well have been Ginny Carroll, who was Newsweek's principal reporter on Christian religious affairs; but sad to say, Ginny is dead. Your conjecture seems entirely reasonable, but none of us can confirm it... I think you are probably safe to use your conjecture for the source, along with 'probably.' best, larry martz". 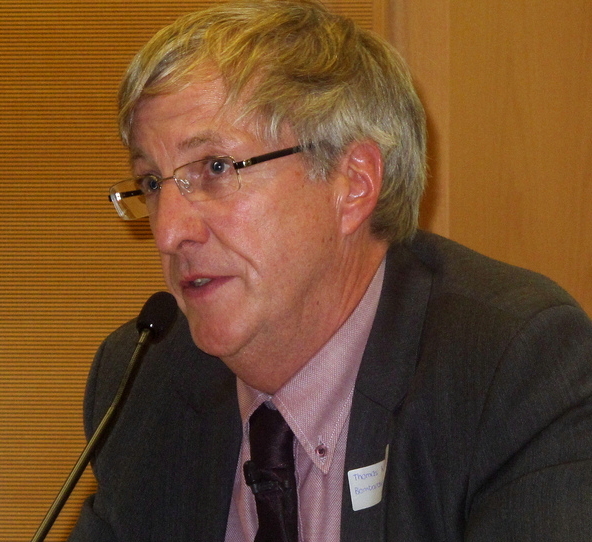 * NCSE Also Sees CRSQ as the Source for this "Count": From the anti-creationist group founded by Eugenie Scott, the National Center for Science Education, Glenn Branch writes, "As for 700, I speculate that it was chosen as the number of members of the Creation Research Society, which requires its voting members to have earned a 'postgraduate degree in a recognized area of science.' Its membership hovers around 700... So... ~0.75% would have been a better estimate of the prevalence of creation scientists in the U.S. life sciences and earth sciences communities circa 1987." Branch admits that his "better estimate" is only a "lower bound" (because of the invalid statistical method used) yet concludes by referencing the "97%" of scientists who agree with the (highly ambiguous) statement that "living things have evolved", a sentiment shared by most creation scientists. NCSE seems to consistently ignore, as documented over at rsr.org/doubting-darwin, that "60% of all U.S. medical doctors reject the strictly secular Darwinist explanation for our existence, with three of five docs agreeing that either God initiated and guided the process that led to human life or that God specially created human beings." See more on the Newsweek saga at rsr.org/newsweek-99-percent-of-scientists-reject-creation-1987. * Sure Scholars Doubt Darwin, But What Do Christians Doubt? 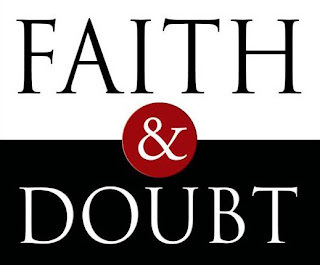 In a discussion over at Prometheus Unbound, Santi, an agnostic, asked RSR host Bob Enyart about his doubts. You can read that discussion and Bob's answer over at rsr.org/on-doubt that begins like this: Santi, to help myself think this through, I’ll first list the things I never ever doubt. - I never doubt that I exist. It's Our Annual February Telethon! If you enjoy Real Science Radio, we need your help to stay on the air! Every year Bob Enyart Live (which hosts Real Science Radio) has a telethon to raise the $40,000 that is absolutely vital to help keep RSR on the air! Please help us if you possibly can! The Bob Enyart Live talk show airs at KGOV.com weekdays at 5 pm E.T. Also, same time, same station, check out Theology Thursday (.com) and on Fridays, Real Science Radio (.com) a.k.a. rsr.org. All shows are available 24/7 and you can call us at at 1-800-8Enyart. Didn't expect to see you on TOL today, Bob! Lawrence Krauss's assertion is ignorant and laughable. Accepting biological evolution doesn't equate to atheism at all.